In this fast-paced world, we realize that time is of the essence for you. So let Monastery Greetings help you show your appreciation to employees, trustees, and donors, by shipping gifts directly to your desired recipients. Each package includes a gift message printed on the label outside the box and on the packing slip inside the box. Quantity discounts apply to gift packs shipped to one address, and special prices apply to all cases and personal selections! Simply supply us with your gift list by e-mail, phone, fax, or mail, let us know the desired arrival date and gift inscription, and Monastery Greetings will do the rest! Order early for guaranteed Christmas delivery! Although all items can be purchased and shipped as corporate gifts, here are some items that we recommend. Attractively packaged with 3 or 6 pre-selected flavors, for convenient gift-giving. 12-oz. jars. Blueberry Preserve, Concord Grape Jelly and Cranberry Conserve. 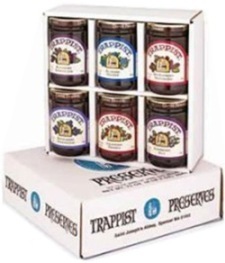 Blackberry Seedless Jam, Boysenberry Seedless Jam & Red Raspberry Seedless Jam. Strawberry Preserve, Seville Orange Marmalade and Blueberry Preserve. A feast for the eyes and taste buds! 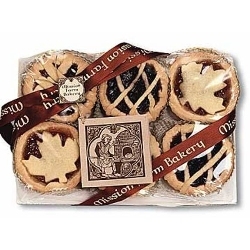 Each miniature pie is topped with a decorative crust through which peeks the glossy shine of cooked jam. One bite and you'll discover the sweet, buttery crunch of the crust and the fruit-filled flavor of the jam. Six tarts (2 of each flavor) shrink-wrapped and tied with Mission Farm ribbon. Net weight approx. 14 oz. 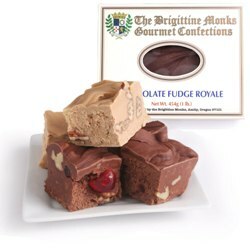 In Oregon's Willamette Valley, the Brigittine monks of Our Lady of Consolation Priory quietly go about producing some of the most delicious, rich and creamy fudge in the world. They use only the best ingredients -- including fresh dairy butter, semisweet and bittersweet chocolate, Oregon walnuts, pecans and candied Oregon cherries -- and have received praise from candy experts and critics alike. Now it's your turn to try this famous, handmade gourmet treat! Net weight 1 lb each. The chef in the royal employ of the Duke and Duchess of Windsor generously provided the monks with the recipe for this dark, rich, traditional style of fruitcake. Made with raisins, pineapple, currants, orange & lemon peel, walnuts, and wine. 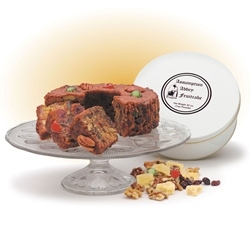 Laced with rum, spicy, moist fruitcake is a holiday favorite. 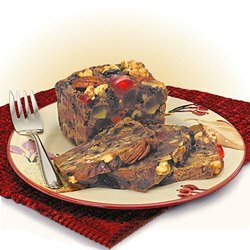 If you're not a fruitcake lover, this will make you one! Decorative, re-useable tin; net weight 2 lbs. Traditional cookies made by Benedictine Sisters in the monastery's bakery using simple ingredients, classic recipes, time-honored techniques and (of course) lots of prayer. These are truly Old World style cookies! Net weight approx 12 oz..
SPRINGERLE (6 cookies): Anise-flavored, crisp outside, soft inside. Cookie molds (with symbols of Christmas) are over 100 years old, brought by the sisters from Germany. GINGERSNAP (10 cookies) : Said to have been invented by Benedictine monks, this sugar-coated cookie, chewy and spicy, is loved by young and old alike. HILDEGARD (5 cookies) : St. Hildegard's own recipe! She recommended them for slowing the aging process, creating a cheerful countenance, lightening a heavy heart and releasing intelligence. They're delicious, too! SHORTBREAD (5 cookies) : The simple, classic butter cookie that's simply delicious! The Carmelite Monks of Wyoming have a great passion for coffee and are using that passion to fund the construction of a new monastery in the American West. They also hope to add a new chapter in the history of coffee. Monks are perfectionists in all their labors and it shows in their selection of beans, roasting and blending of flavors. 12-oz. bags. Ground coffee only. 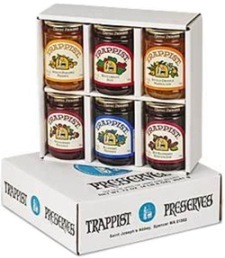 Old-fashioned, dark, rich, and moist cakes baked by Trappist monks using the finest ingredients – dried and candied fruits, nuts, and local farm-fresh eggs. BRANDY FRUITCAKE with pineapple, cherries, walnuts, and pecans, and soaked in 120-proof brandy and aged to delicious perfection. GINGER DATE NUT CAKE with California tree-ripened dates, walnuts, pecans, cashews, and ginger, soaked in brandy and aged. TROPICAL DESSERT CAKE with tropical fruits and nuts: papaya, mango, pineapple, almonds, and macadamia nuts; soaked in rum and aged. All in convenient 1 lb. sizes! 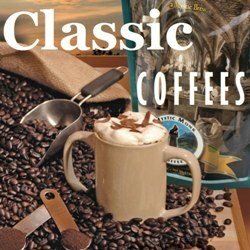 In addition to bestselling Mystic Monk Classic Coffees, the Carmelite Monks of Wyoming offer specialty coffees each month. 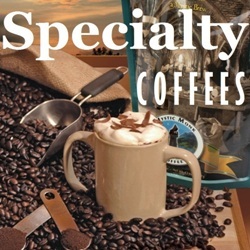 Now, through its buying power, Monastery Greetings is able to offer these Mystic Monk Specialty Coffees year-round!